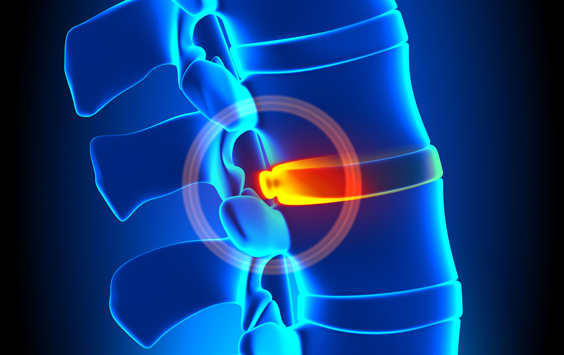 Spinal discs are designed to act as cushions between the vertebrae, or bones, of the spine. These cartilage-based structures are made up of an outer shell which protects the gel-like, inner portion of the disc. This outer shell is known as the annulus fibrosus, while the inner, cushioned part is called the nucleus pulposus. These intervertebral discs perform several important functions, such as providing shock absorption for the spine. They also allow for movement of the vertebrae, and act as a ligament to keep the vertebrae separated while holding the spine together. A disc bulge happens when the annulus fibrosus develops cracks or ruptures, and the nucleus pulposus (the inner part of the disc) seeps its way through and bulges out. This condition can put pressure on the nerves of the spine, thereby causing serious pain. A disc herniation is diagnosed when this center bulges out and moves backward toward the spinal cord. While disc bulges and herniations are the most common incarnations of disc problems, disc desiccation – a serious but rare condition that usually leads to surgery – can also occur. The lower back (lumbar spine) is the most vulnerable to disc problems, but bulged and herniated discs can also affect the neck (cervical spine) and upper back (thoracic spine). An individualÕs symptoms will depend on where the disc issue has occurred in the spine. A herniated disc in the lumbar spine, for example, may cause back pain, leg pain, numbness, weakness, and/or bladder and bowel problems. Disc Degeneration: During childhood, intervertebral discs are composed of about 80% water. When the body begins to age, the discs dry up and become less flexible and more vulnerable to damage. Too little or too much low back curve can also place unwanted pressure on the disc and cause it to degenerate at an advanced rate. A physical therapy program for disc problems usually includes both passive and active rehabilitation to relieve pain and restore movement and flexibility. Passive physical therapy might include ice and heat therapy, low level laser therapy, electrotherapy, and/or ultrasound. Active therapy is the exercise component of physical therapy; it is used to minimize pain and, eventually, help patients build strength and stability to avoid future injuries. When pain is caused by compression of the spinal nerves (as is the case with herniated and bulged discs), spinal decompression helps to relieve pain by removing pressure on the nerves. Spinal Decompression specifically targets problematic discs and creates a vacuum effect in which the herniation itself can be reduced. The practice of Spinal Decompression creates negative pressure within the disc, which draws bulging disc material back into its outer shell. During this process, the outer shell is able to heal. Spinal Decompression is a non-surgical, drug-free option for addressing both the symptoms of disc injuries as well as correcting the actual cause of pain. Chiropractic Care for Herniated and Bulged Discs Over the course of a lifetime, maintaining the health of the spine can help patients avoid many painful conditions, including disc injuries. Because many disc injuries occur as the result of consistently poor posture, sustaining good posture through chiropractic care is an essential element in remaining pain-free. When disc injuries have already occurred, chiropractic treatment is an obvious choice. While many disc patients believe that chiropractic care involves ‘popping’ the disc back in place, chiropractic care does not, in fact, use aggressive force in cases of disc injuries. Rather, chiropractic for disc injuries involves gentle manipulation designed to ensure the health of the spine, reduce pain, and increase movement and flexibility. With a staff that includes a Physical Therapist, Chiropractic Doctors and Massage Therapists, Longmont Spine and Physical Medicine offers integrated, multi-disciplinary care for disc injuries. By incorporating all of these modalities in one facility, our team provides conservative and effective strategies for reducing many painful conditions, including disc injuries. In many cases, we are able to help patients rehabilitate without surgery or damaging drug use.